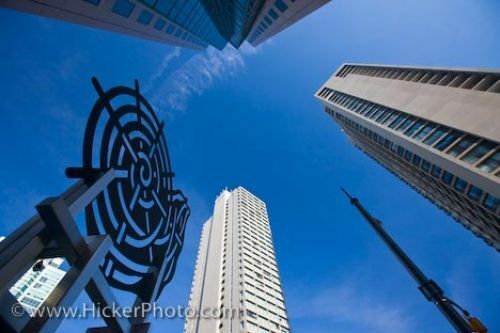 A sculpture is seen on the street among towering high rises. The artwork is part of downtown Toronto City. The black circular artwork is in contrast to the tall straight high rises. This view shows the sculpture in comparison to the towering high rises. Sculpture on the street in downtown Toronto City, Ontario, Canada.